Join Miami based Za Yoga teacher, Zamanta Archibold as she guides you through a spiritually powerful but lighthearted and fun practice. Discover why yoga is a wonderful way to create a consciously healthy and happy lifestyle. Share her passion for life in a series of postures that touches your heart and explore the principals of acceptance and compassion. When we become aware of the energy force within us, we light up the universe in an exceptionally positive way. That brilliance is expressed in yoga through the union of self-energy with universal vitality. Let the rhythm of your soul beat completely through the flow of your heart. Dress comfortable, bring a mat, a smile and an open heart. Zamanta Archibold, a Panamanian born New York Interior Designer, began her yoga practice in the Dominican Republic in 2002, while pursuing her Black Belt in Karate. Although her roots began in Asthanga yoga, she received her certification from Swami Brahmavidyananda at the Institute of Holistic Yoga in Miami and is a registered yoga alliance teacher, E-RYT. In 2008, she made Florida her home. She lives and teaches in South Miami, while caring for her daughter and dogs. 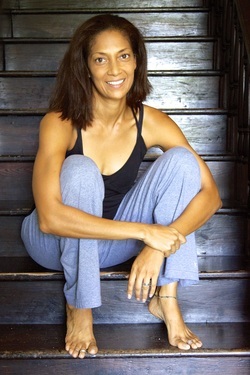 Her unique rhythm and energy combined with years of practicing a variety of yoga styles has created a personalize yoga approach. Each class is individual with focus on alignment, movement, spirituality and having fun! She leads workshops and international retreats while serving the community through Yoga4Vets, Hear Me Now and Connected Warriors. As for the future, Zamanta continues to use hatha yoga to break the barriers of our mind, Juana yoga to reach our soul, Karma yoga to reach our community. Her ultimate goal is to create a home for the five principals of yoga; Bhakti, Juana, Karma, Raja and Hatha.